Long before Alexander Graham Bell made history by asking Thomas Watson "to come here", two Englishmen had already initiated a telecommunications revolution that by 1876 had delivered a global network with countries being interconnected by thousands of miles of oceanic cables. The so called Victorian Internet had been established, was fully operational and impacting many aspects of everyday life. Through this article, I wish to explore the technology of that period ‘before the phone’ when the world relied on the electric telegraph to keep in touch. The opening of the Stockton to Darlington Railway in 1825 and the Liverpool to Manchester Railway in 1830 transformed the country in many ways. But, significantly, they moved the driving force for better communications away from the military and towards industry and commerce. If the railways were to expand and reach their true commercial potential then they needed a means of communication which could work at any time of day, in any weather, around corners and through tunnels. Faced with this challenge it was Charles Wheatstone and William Cooke, who on 25th July 1837, demonstrated their needle telegraph system by sending messages using electricity over 20 miles between Camden Town and Euston Stations on the London to Birmingham Railway. 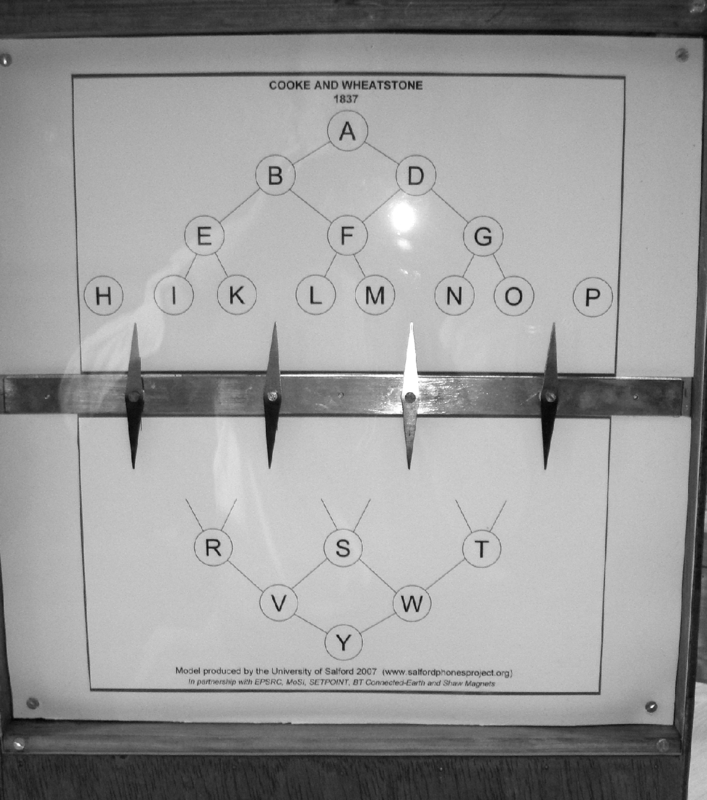 Figure 1 shows our working model of a Cooke-Wheatstone four needle telegraph which is a slightly later version of the one used in July 1837. Here four needles can be deflected independently either to the right or left by means of passing a current through an electromagnet which is placed behind them. Moving one or two needles means that you can point to one of a series of 20 letters of the alphabet. Yes that’s right, only 20! Letters C, J, Q, U, X and Z could not be represented and substitutes had to be used. That was not the only limitation; four needles requires four electromagnets and hence five wires, or four wires if you use a common earth return, and in 1837 manufacturing and laying that quantity of wire was not easy. Nevertheless the dawning of the electrical communication age had arrived and two years later the Great Western Railway became the first to formally commission an electrical telegraph being installed between Paddington and West Drayton at a cost of £3,270. Wheatstone and Cooke continued to improve their needle telegraph producing a two needle version in 1840 and a single needle model in 1845. However, reducing the number of needles totally changed the way in which messages were sent. 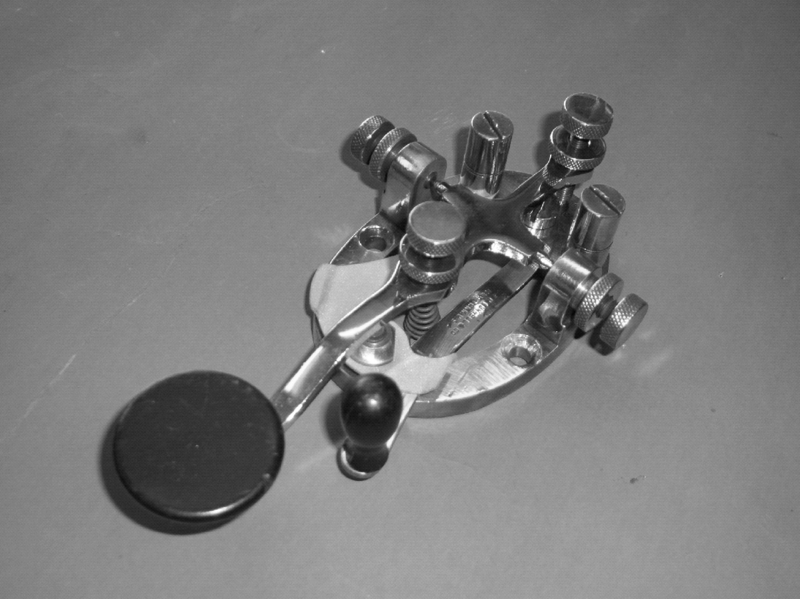 The four needle telegraph is termed a ‘direct reading’ instrument in that when a needle or needles move, they physically point to the letter being sent. When you reduce the number of needles, you can no longer do this and you need a code to represent each letter. So, for example, in a two needle telegraph, the letter B is represented by three movements of the left needle to the left, whilst the letter U is represented by both needles first being moved to the right and then to the left. Not easy to remember and so it is no surprise that the telegraph operators had to become very skilled people. The growth of the electrical telegraph into a global telecommunications network has, of course, to be attributed to the work of three Americans – Morse, Vail and Gale. Samuel Finley Breese Morse was born in 1791 and proved to be a talented painter, becoming Professor of painting and sculpture at the University of the City of New York. One of his paintings was even exhibited in the White House. His interest in telegraphy began in the 1830s and in 1835 he had produced an initial working model. 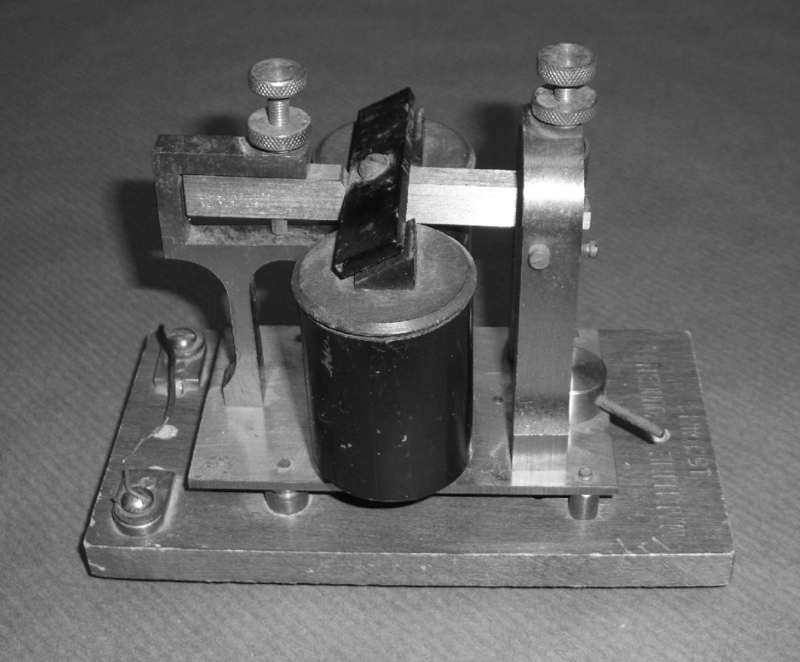 However, with the help of Professor Gale and then Alfred Vail, he was to transform this early idea into the now famous Morse Telegraph with its associated Morse Code. The first Morse telegraph system was completed on 24th May 1844 with a line between Washington and Baltimore along the Baltimore and Ohio Railroad. 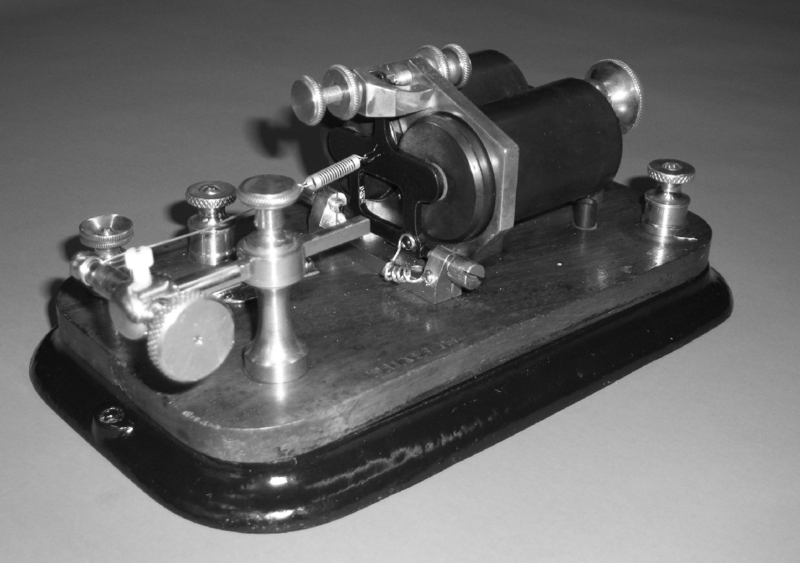 The Morse telegraph relies on sending information as a series of coded electrical pulses – either long or short. So for example, a letter A is represented by a short pulse followed by a long pulse; or as we prefer to call them a dot followed by a dash. The story of the letter V is interesting and also probably fictitious. It is claimed that Morse’s love of Beethoven’s fifth (V) symphony meant that dah dah dah daaah became dot dot dot dash! 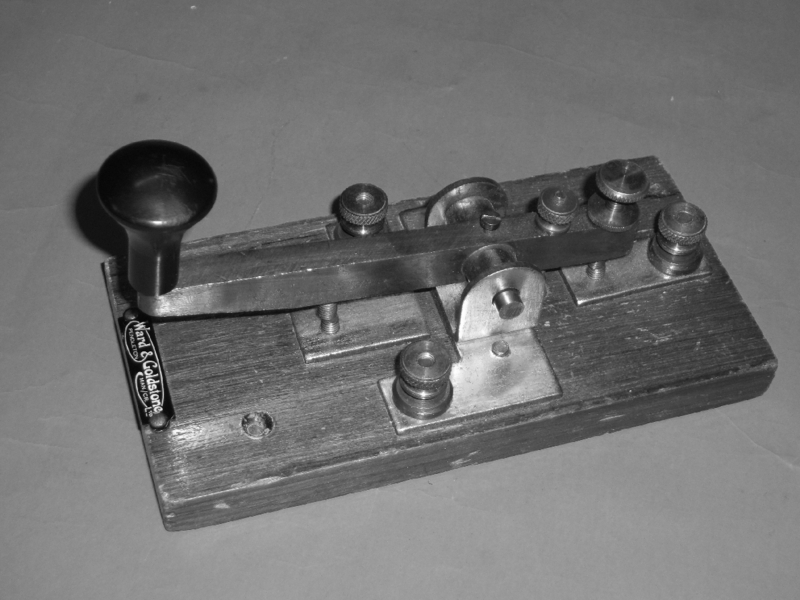 A Morse telegraph system comprises two main components; a device for sending the dots and dashes – a key – and a device for receiving them – a sounder. A key is simply a single pole on-off electrical switch. When depressed the key closes a set of electrical contacts and when released, the contacts open. 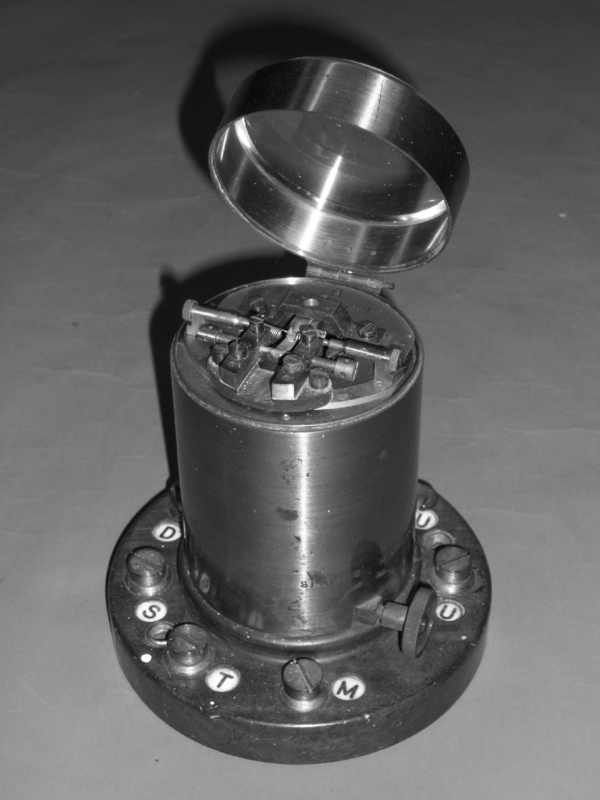 Figure 2 shows a key manufactured by Ward and Goldstone of Salford. However, this key has two sets of contacts. The ones at the rear are normally closed and a front set are normally open. Depressing the key closes the front contacts and opens the rear ones. This is important where you have several keys in series along the same telegraph line. When not in use, the key keeps the line continuous so that a signal from a key further up the line could still pass through to one further down the line. Figure 3 shows an American key manufactured by J.H. Bunnell & Co. of New York. 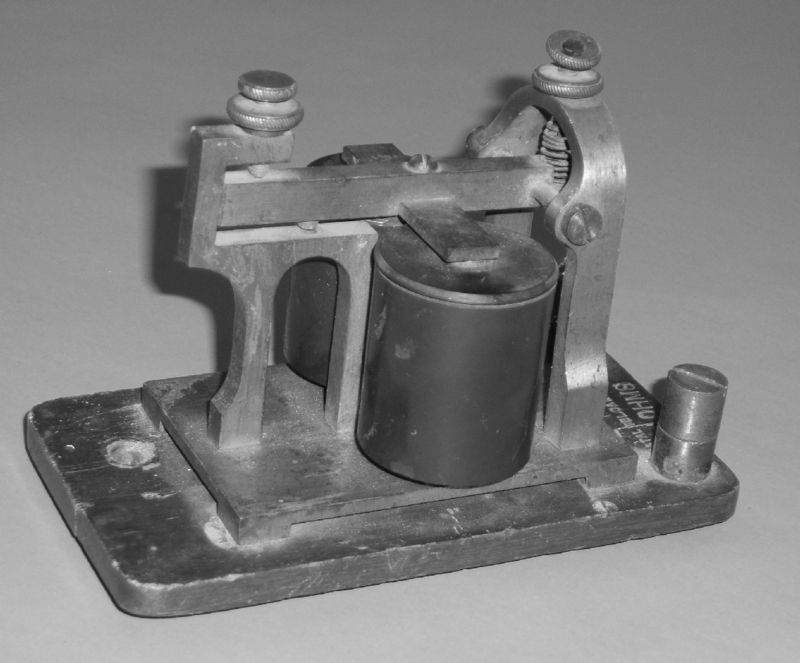 This type of key was used on closed working lines where a voltage was always maintained on the telegraph line even when no information was being sent. When not in use, a shorting lever is moved to close the key contacts. The beginning of a message would therefore be signified by opening the shorting lever and hence, removing the voltage from the line. Pressing the key then closed and opened the contacts in the usual way with the shorting lever being returned to the closed position at the end of the message. A sounder converts the electrical dots and dashes into something which can be heard. The sounder comprises two coils of wire wound around a soft iron core and connected so as to form a single electromagnet that when energised forms a horseshoe magnet. It is important to connect these coils correctly otherwise the magnetic field from one will counter-act the field from the other. The resulting magnetic field then attracts an armature which is connected to a large brass arm. This arm moves against the action of a spring and hits an end stop and when the electric current stops, so the spring returns the arm, hitting against a second end stop. It is the noise of the arm hitting the end stops that allows the dots and dashes to be discerned. Several adjustments are provided for altering the tension on the spring, the air gap between the armature and the electromagnets and the position of the end stops. However, it is important to ensure that an air gap is always maintained between the armature and electromagnet to prevent the armature becoming magnetised and hence, preventing a quick release when the electric current stops. Figure 4 shows a J.H. Bunnell main line sounder type 15B. The total resistance of the electromagnet coils is 150 ohms which means that it is a main line sounder. This type of sounder would be directly connected to the telegraph line and operate with a typical current of 40mA. However, the longer the telegraph line, so the electrical signal diminishes due to losses. Generating a usable 40mA current at the end of a long line would require a very high and normally prohibitively high, voltage. The solution was therefore not to connect a sounder directly to the telegraph line but instead, attach a device known as a relay. Figure 5 shows a J.H. Bunnell relay that was manufactured for the Western Union Telegraph Company. This relay is rated at 150ohms but only requires 16mA to operate. The reason for this is that a relay is not trying to move a large brass arm but instead, to move a much lighter armature which requires less magnetic force to move it and hence, less electrical current in the electromagnets. As the armature moves so it makes an electrical contact; the armature forms one pole of a switch just like a key. The armature therefore makes or breaks a second electric circuit. This second electrical circuit then connects a local battery to a local sounder thereby allowing any current to be generated. Figure 6 shows a Post Office Standard Type B relay. This differs from the J.H. Bunnell relay in two important ways; firstly it is constructed in a vertical orientation and secondly, it is polarised which means that it contains a permanent magnet curved around the electromagnets. The coils of the two electromagnets, each of which is rated as 100 ohms, are differentially wound with the ends of each coil being labelled D and U and D circle and U circle respectively. These letters reflect a railway legacy with D representing the Down station and U, the Up. Two contacts are also provided; Space (S) and Mark (M) with a third contact Tongue (T) which moves between then making contact either with S or M. When a current flows from D to U (or D circle to U circle) the Tongue is deflected to make contact with S and should the current be reversed so the Tongue would be deflected in the opposite direction and make contact with M. The current flowing in one direction enhances the magnetic field provided by the permanent magnet whilst, reversing the current causes the magnetic field generated by the coils to oppose that of the permanent magnet. Unlike the J.H. Bunnell relay described earlier, here the direction of the current results in a different operation of the relay. Relays therefore connect local sounders driven by a current supplied from a local battery which allow for higher currents to be provided. 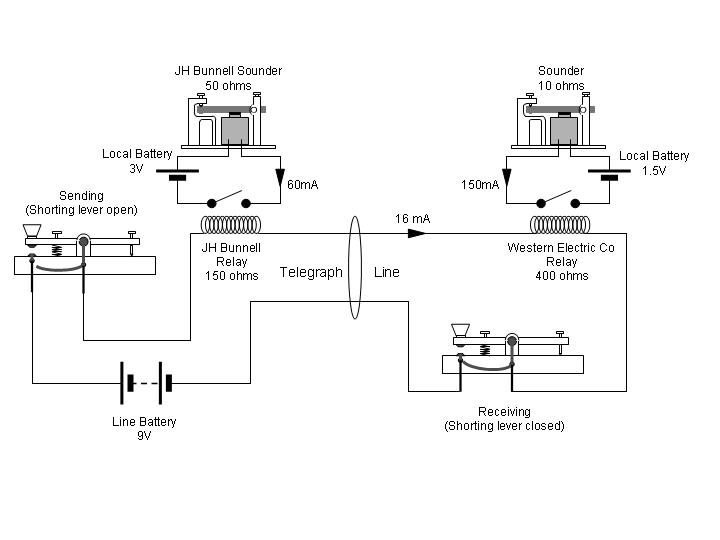 Figure 7 shows an example of a local sounder that is labelled "Postal Telcable Co" and rated at 10ohms. Physically, a main line and local sounder are very similar and therefore in order to move the brass arm, a similar magnetic field strength is required. Comparing a main line and local sounder, given that they need to generate the same magnetic force, then the product of the number of turns in the electromagnetic coils and the current flowing through those coils needs to be equal. However, a local sounder can operate on a much higher current and therefore does not need as many turns of wire in the coils making up its electromagnets. If there are less turns then so too the length of wire making up these turns will be shorter and since the resistance of a piece of wire is directly proportional to its length, if the wire is shorter so its resistance must be less. Local sounders will always have a lower resistance than main line sounders for this reason. In order to demonstrate the operation of a typical Morse Telegraph system and to give people an opportunity to send messages using Morse Code, we have constructed a fully operational demonstration system using original equipment. Figure 8 is the circuit diagram of our system. It comprises two telegraph stations wired in a closed line, central battery configuration. A line battery of 9V generates a line current of 16mA which passes through two keys with shorting levers and two relays; one rated at 150ohms and the second at 400ohms. These relays each drive their own local sounders; one rated at 50 ohms and driven from a local battery of 3V providing a sounder current of 60mA and the second rated at 10 ohms and driven from a local battery source of 1.5V providing a sounder current of 150mA. Listening to the noise made by a sounder and determining the message being sent required incredible skill. It also required an operator to be present at all times in order to receive every message. Pen registers or ‘inkers’ were machines that could print the Morse Code dots and dashes directly onto paper tape. Figure 9 illustrates a J.H. Bunnell single pen register. When originally purchased this item had several key components missing and so has undergone major restoration with several parts having to be made from scratch. The incoming Morse signals pass through electromagnets which, just like a sounder, attract an armature which is connected to a moving inker arm. When the electromagnet attracts the armature so the inker arm moves upwards, pressing the paper tape against an inked roller. In this way a dot will generate a short ink mark and a dash a longer ink mark on the paper tape. The paper tape is wound on a reel and is driven by a clockwork mechanism and a set of feed rollers. However, the really interesting part about this machine is its automatic start and stop mechanism. In other words how does it know when a message begins and ends? Figure 10 shows the insides of the pen register. When the first dot or dash of the message is received, the armature of the electromagnet is attracted and is connected via a linkage to a moveable pin. In its normal position, this pin interrupts the clockwork mechanism which is held in a stop position. However, when the armature moves, so the pin moves and releases the clockwork mechanism. A spring pulls the pin to engage it with a timing thread. As the clockwork mechanism runs, so this timing thread rotates and moves the pin back towards the clockwork mechanism stop. However, each successive dot or dash continues to move the pin away from the clockwork stop. Therefore whilst the message is being received, the pin is kept away from the stop and so the clockwork mechanism continues to run and feed the paper tape off the reel, through the feed rollers and between the inked roller and inker arm. 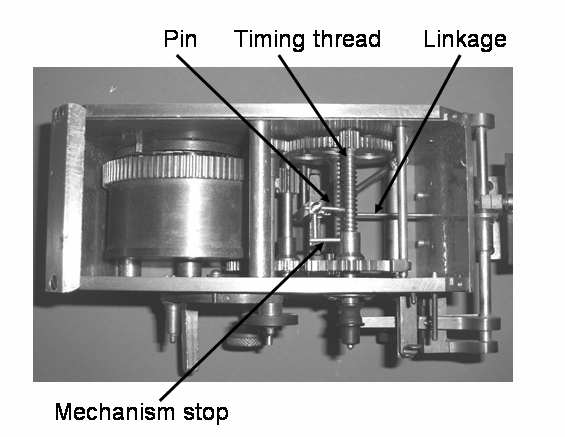 After the last dot or dash of the message is received so the pin remains engaged in the timing thread and moves back towards the clockwork mechanism stop. When it reaches the stop, the clockwork mechanism is stopped. Adjustments are provided to control where on the timing thread the pin is moved to by the armature. The further along the thread, so the longer it takes for the pin to return to the clockwork stop. Having built the telegraph networks, their commercial potential was soon realised. On the 16th May 1843 the Great Western Railway launched a public telegram service using its electrical telegraph installed along its line from London Paddington to Bristol. The charge to send a message was one shilling and there was no limit on the number of words sent. At each of the main stations along the line, skilled telegraph operators sent and decoded the messages and then ‘messenger boys’ were employed to take these messages and deliver them by hand to local addresses. 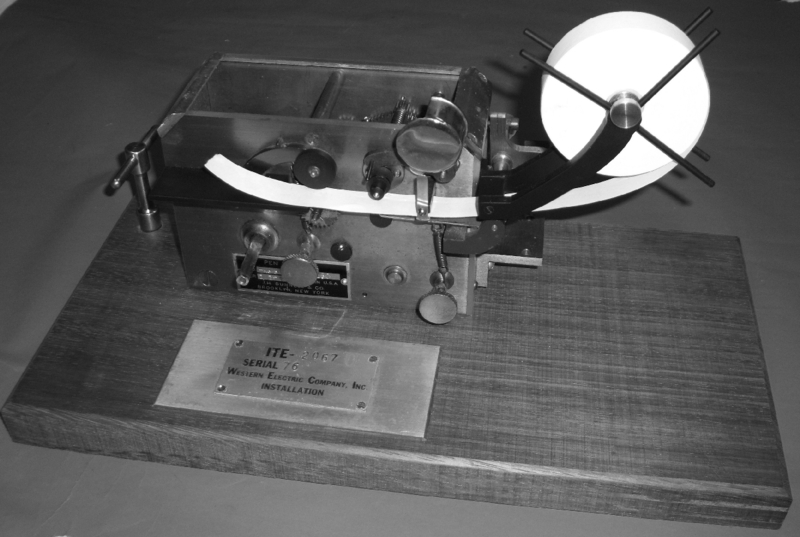 In the USA, commercial telegraphic messages were introduced in 1851 with the formation of The New York and Mississippi Valley Printing Telegraph Company. Five years later it changed its name to Western Union to mark the linking of western and eastern telegraph networks into one system. A new word was required to describe these telegraphic messages and whilst, some suggested "telegrapheme", it was the Americans who coined the now more familiar "telegram" in 1852. The first line of a telegram is called the ‘check’ and includes a set of abbreviations that indicate the number of words, where it came from, and the class of service. The name and address of the recipient follows the check and thereafter the actual message which was hand written by the telegraph operator. As telegraph networks grew so too did the popularity of sending telegrams turning it into a significant business growing from 99,000 messages in 1851 to over 3.7 million in 1868. 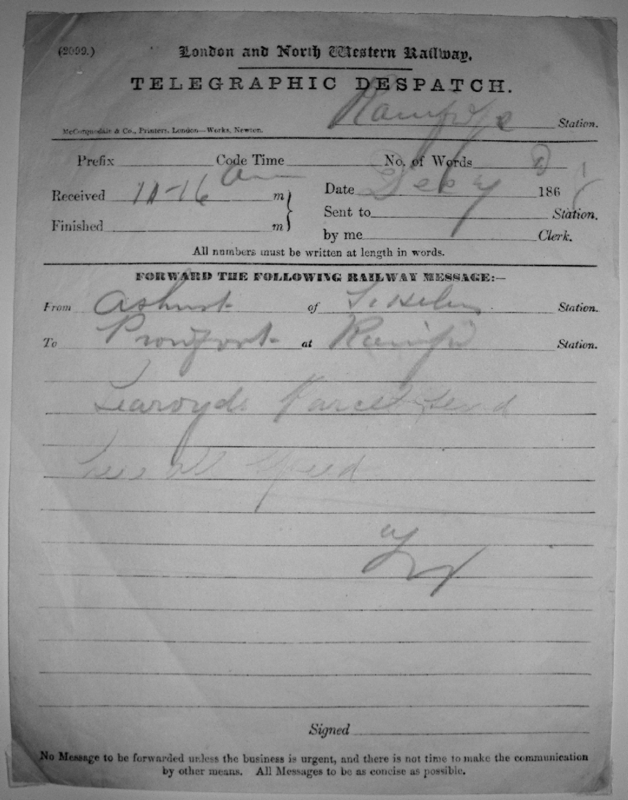 Figure 11 shows a typical telegram as sent over the London and North Western Railway. The electric telegraph rapidly grew to form the world’s first truly global communications network. Within the UK there were 1300 telegraph stations communicating over 10,000 miles of telegraph line in 1868 but only four years later this had grown to 5,179 stations and over 87,000 miles of line. A telegraph line was laid under the English Channel in 1850 and very significantly, the first operational trans-Atlantic telegraph cable was completed in August 1858. Whilst that cable had a very short life – just one month - it did nevertheless prove that such a venture was a practical reality and had commercial value too; a total of 400 messages were sent from Valentia Bay in Ireland to Trinity Bay in Newfoundland whilst the cable was operating. A permanent connection was finally established between the ‘old’ and ‘new’ worlds in 1866. In 1868 the Disraeli government introduced the Telegraph Bill to "enable the Postmaster General to acquire, maintain and work the Electric Telegraph in the United Kingdom". By 1870 over 2000 men and 500 women were employed by the telegraph companies in the UK and in recognition of this growing profession, The Society of Telegraph Engineers was formed in the UK on 17th May 1871. Today that Society has evolved into the Institution of Engineering and Technology. So when Bell published his patent for "Improvement in Telegraphy" in 1876 and in so doing offered the world the new phenomenon of the telephone, the world wasn’t immediately interested for it already had a perfectly effective and widespread global communications network. Even the Western Union Telegraph Company would famously proclaim in an internal memo dated 1876, that "this telephone has too many shortcomings to be seriously considered as a means of communication. The device is inherently of no value to us." The telephone did eventually have its day to become the communication system of the masses. However, as the first true global telecommunications network, the electrical telegraph has a very important place in our history. In compiling our telegraphy collection and researching this article, I would like to express my thanks and gratitude to the following people. John Liffen of the Science Museum who provided invaluable help with the history of the early Cooke Wheatstone telegraph. Fons Vanden Berghen who has a wonderful collection of telegraphy instruments of Europe and who helped unlock the secrets of the finer workings of our JH Bunnell pen register. Dr Joe Jacobs who has preserved the history of the JH Bunnell company and through his son kept that famous name alive to this day.